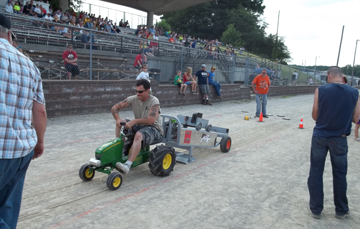 ​Join the fun, fast growing sport of Pedal Pulling!! This sport can compliment any town event, county fair, or church event. It’s family entertainment, sportsmanship and good, clean fun. Trophies for the top three places in each age group, paid for by events or their sponsors. Loud speaker system (which we run from the back of our trailer) so the audience can hear the names of the competitors and the distances of their pulls, plus your sponsors’ names. Also included in our event is pedal pulling for adults 12 years and up. The registration fee for this is $5 per adult pulling. $2.50 of it will be given back to your event. Prizes for the event - Bragging Rights! A small sanction fee to qualify your event’s pull for state level competition. An alternative site in case of bad weather, such as under a tent, in a park building or a fire station. Two to four volunteers to help at the pedal pull, to bring the tractors back to the starting line or give out the trophies and keep a local flair to the event. Each participant must register prior to the start time of their age group. Any arguing with the track officials by a contestant, parent or guardian, will not be allowed and could result in disqualification of the contestant. All rulings by track officials are final and may supersede any of the above rules. In the case of need, a sled may be re-weighted and the group may start over. Sanctioning in OHIO: a sanctioned pull will qualify the top three girls and top three boys in each age division.